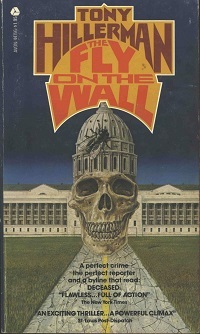 This is a paperback edition of The Fly on the Wall, published by Avon in 1979. There were at least four print runs of this edition, and changes were made to the covers and identifying marks for each run: The first run was issued with a cover illustration that depicted the United States Capitol building with a human skull underneath the dome and a house fly sitting on the dome. This version was listed as Avon 58859. The second run has a different cover illustration depicting a typewriter in a desert landscape - a wrecked automobile is shown in the middle distance. The fourth run maintained the same cover art, but was labeled as Avon 64410.